A pair of skiers enjoy the east side traverse of Montezuma Bowl at Arapahoe Basin Ski Area on a bluebird day Saturday, March 4. With an extended season, A-Basin can expect a lot more snow before eventual closure. The region’s ski areas reported no new accumulation early Monday morning, but the weather outside later in the day told a different story. Forecasts called for as much as a half-foot of fresh snow by the time chairlifts started spinning again this morning. The afternoon flurries, which caused reduced visibility on the interstate and the county’s other primary connector roads Monday, were the first of note in about a week. They also helped to revive hopes of a stormy spring in March and April after an underperforming February. Riding on the coattails of heavy snowfalls in December and January, the area resorts were still reporting above-average seasons to date. Arapahoe Basin Ski Area stood at 266 inches of total snow, or 131 percent of typical years at this time, which was also nearly 90 inches more than the same date during the 2015-16 season. Keystone Resort, meanwhile, continued with the fourth-snowiest season in ski area history with its 221 inches-to-date. Copper Mountain Resort stands at 225 inches with a yearly target of 304. Nonetheless, A-Basin saw just 34 inches in the entire month of February, compared to its average of 45, and Keystone saw 28 inches fall during those same 28 days, as opposed to its usual 37. The predictions expected the current front to stick around as long as this afternoon before another multiple-day dry spell. Additional weather wasn’t expected until late Friday at the earliest, and even then it appears it will be small bursts. Loveland Ski Area, in neighboring Clear Creek County just east of Eisenhower Tunnel, maintains its edge in the region for the year’s total snowfall despite opening on Nov. 20 this year — a full month after A-Basin. Loveland reported 44 inches in February for a grand total of 272 on the season. The ski area routinely experiences more than 420 inches a year, though missed that mark by 3 ½ feet last season. The majority of area resorts missed the mark in 2015-16, in what was otherwise considered a fairly average year. Keystone reported surpassing its normal 235 inches by more than 4 feet, while Breckenridge Ski Resort stated it hit its annual measure of 353 inches right on the head. But unless spring ends up unloading record-setting precipitation, early thoughts of topping previous all-time high seasons are now likely out the window. Breck, for example, recorded 520 inches during the memorable 2010-11 season, so would need more than double its present year-to-date total of 235 inches to even approach it. That doesn’t mean new storms aren’t still welcome. 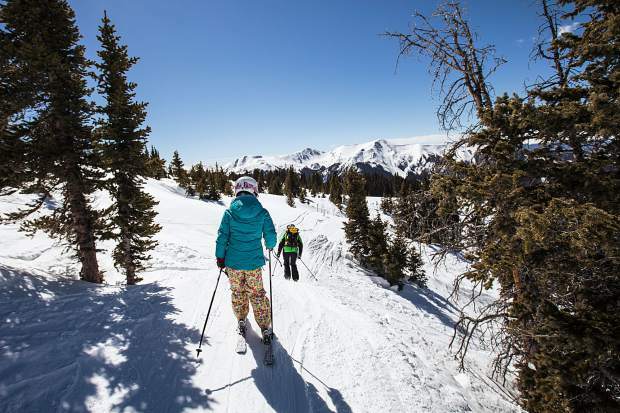 Each of Loveland and A-Basin will have the most extended season though, and won’t look at closing before May and June, respectively, so opportunities for reaching average annual totals remain feasible. It all just ends up being about how the spring snow falls.